DELANCE has created a line of watches bedecked in white. and renew your oath of infinite love. Like the orchid, the watch tells the eternal story of women. With its forms and lines, it evokes femininity and its universal values. In this way, it is the ideal gift for the ideal lady. The smooth side of the gold case expresses her femininity and her gentleness, while the textured side reflects her determination. Six diamonds surrounding a ruby symbolize the dove and her dream of universal peace. This unique Delance “White Lotus” timepiece represents renewal and hope by the symbolic joining of water, the lotus flower and the wheel suggested by the nine diamonds set in the form of a lotus. 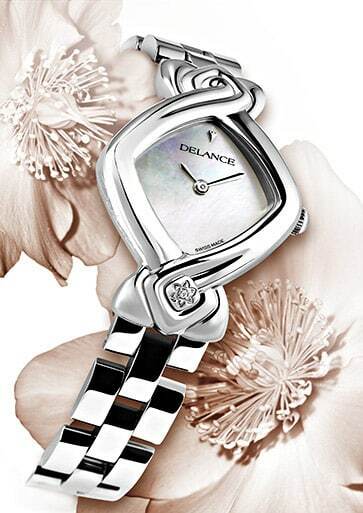 Her DELANCE watch will accompany, encourage and support her each time she looks at it. It becomes her own private, silent mentor, a TalisWOman, helping her to accomplish her destiny.